Natural Ways to Cure Fire Burns on the Skin. : Free Healthcare and Fitness Ideas Natural Ways to Cure Fire Burns on the Skin. Natural Ways to Cure Fire Burns on the Skin. 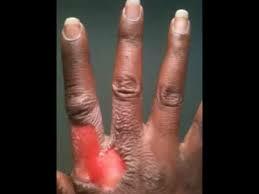 Some of the symptoms of fire burns includes redness of the skin, pain, swelling of the burned areas, blisters etc. 1. Mango Leaves : to do this naturally, get mango leaves, burn the leaves to ashes and mix the ashes with little water and apply the mixture to the wounds cause by fire. 2. Vitamin c; Another way to cure fire burns naturally is to eat lot of fruits like oranges because it contains vitamin c and you know that vitamin c helps in the treatments of wounds and its also help repairs worn out tissues. 3. Honey: In case of fire burns, you can lick honey or use in place of sugar because it helps body repairs especially skin damages. Honey is good for the health and best used for skin related problems or accidents. The last thing i will be recommending in case of fire burns on the skin is to consult a doctor as soon as it happens and later you can use the home remedy recommended above to hasting the treatments processes. Thanks for reading.